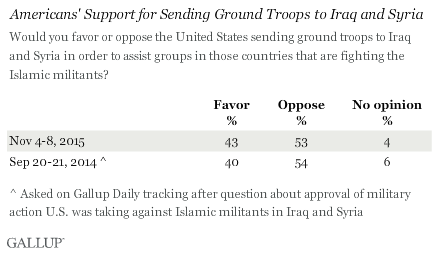 As the U.S. intensifies its airstrikes against Islamic State militants in Syria and Iraq, Americans are more likely to oppose (53%) than support (43%) sending U.S. ground troops to these countries to help groups there fight the militants. These figures haven't changed significantly since September 2014 after President Barack Obama launched airstrikes against the Islamic State group and other militant groups. Americans' evaluations of how the U.S. fight against ISIS in Iraq and Syria is going are now at their worst level since the question was first asked in this poll about one year ago. Seventy-two percent now say that fight is going badly, up from 64 percent in August. Only 21 percent of Americans say it is going well, down from 28 percent.